You are here: Home / In the News / Bernheim tracking golden eagle pair, possibly first pair tracked in eastern U.S.
Clermont, KY – Bernheim officials announced Wednesday that they are now tracking a second eastern golden eagle, a female and companion of the male raptor they have been tracking for four years. The project is believed to be the first pair of golden eagles tracked together in the eastern United States. Bernheim officials cited the large forest block habitat that Bernheim provides as critical to the preservation of this species. 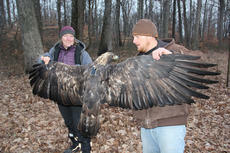 Mike Lanzone and Dr. Tricia Miller, of Cellular Tracking Technologies, hold a golden eagle with a transmitter. In partnership with Cellular Tracking Technologies and Conservation Science Global, the Bernheim team briefly captured the nearly 12-pound female and outfitted her with a GPS satellite transmitter. They are now able to follow her movements along with Harper, the male eastern golden eagle they have been tracking since 2015. Berry said eastern golden eagles are thought to mate for life, but we do not know how or if they migrate together to Bernheim Forest in the winter. If this ends up being a breeding pair, Bernheim can learn how a pair of golden eagles interact during migrations, at Bernheim Forest, and on their breeding grounds in Canada. He called the research opportunity extraordinary for a conservation organization like Bernheim and pointed to Bernheim’s size — 16,137 acres — as the reason why Bernheim Forest is a winter destination for several eastern golden eagles. “Kentucky’s golden eagles need large forest blocks to survive the winter. This project has shown that golden eagles at Bernheim avoid inhabited areas, staying within 5,000 acres of protected interior forest.” Berry said. Bernheim’s Executive Director Mark Wourms said being a part of an interstate and international research effort demonstrates Bernheim’s leadership in conservation. Like her companion, Harper, Bernheim is calling on the public to help name the female eagle. Harper is named for the brand of bourbon Bernheim’s founder Isaac Wolfe Bernheim sold. • Goldie: for the beautiful golden feathers on the crown of her head. • Athena: for the Greek goddess of wisdom, courage and inspiration. • Persephone: for the Greek goddess associated with the changing seasons. Voting began Wednesday at bernheim.org and ends on Feb. 13. Bernheim will announce the chosen name on Valentine’s Day.